Complete Guide to Eco Beach, Prepare to surrender to serenity. 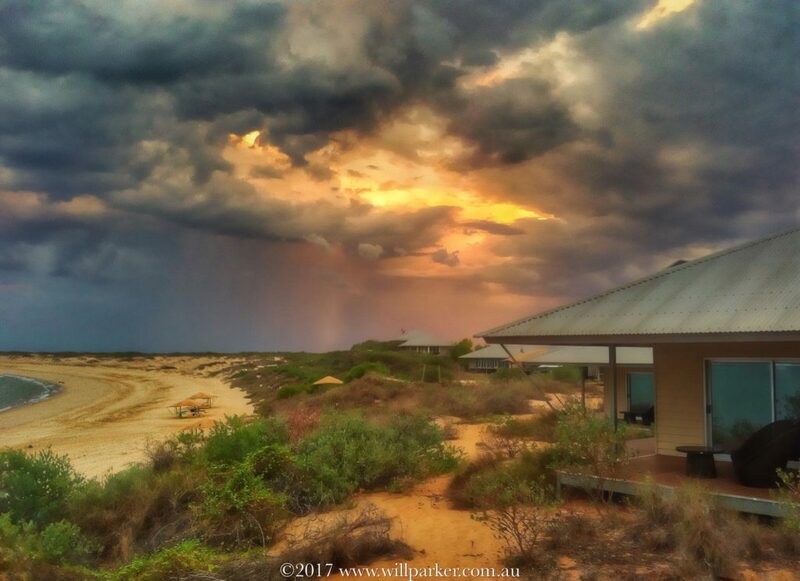 Watching “wet-season” skies from deck of ocean-front villas. 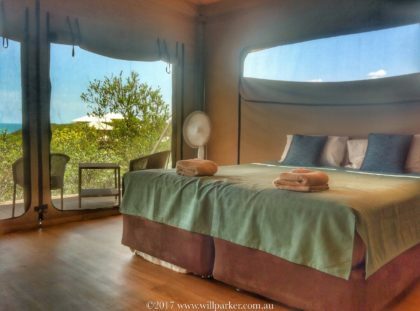 A four and a half star resort in a million star Kimberley wilderness. Remote, isolated and hidden-away. A million miles away from anywhere you’ve been before – such a place? 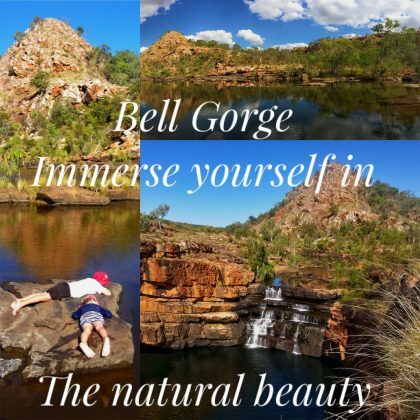 Have you ever wanted to feel a million miles away remote amongst wilderness of raw beauty? Yet feel like you’ve not left home while experiencing it. 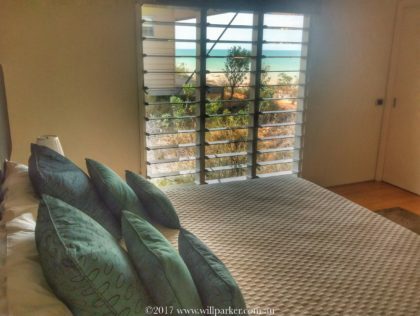 Such a place exists just a stone’s throw away as the ‘Osprey flies’ across Roebuck Bay from Broome in Australia’s North West- “Ngaji Gurrjin” – Welcome and Hello to Eco Beach. 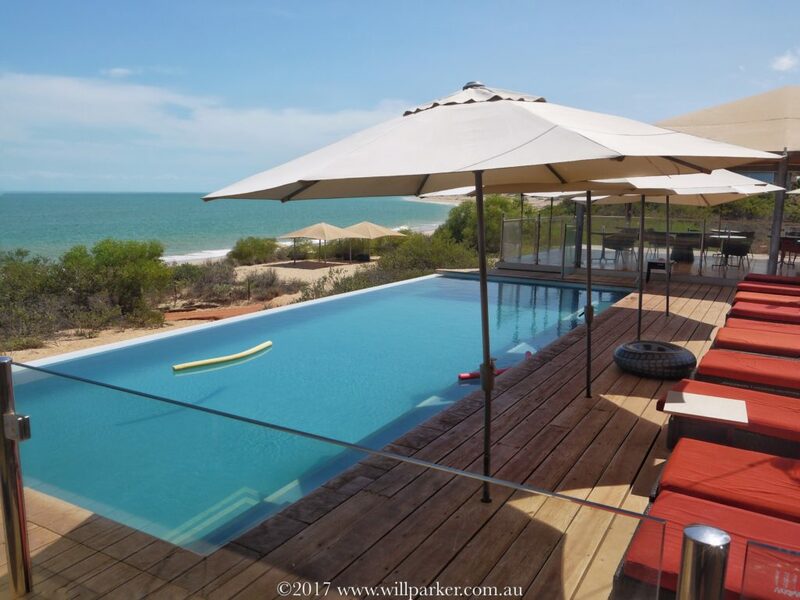 The resort is set on Yawuru Aboriginal land, Yardoogarra is the Aboriginal name for Eco Beach. “Prepare to surrender to serenity” with all but a meagre 10km of Pindan track left to wander before my biggest decision will be to do as much or as little as I wish. A visit to Eco Beach will present you with a diverse variety of activities. All set in the breathtaking West Kimberley coastal environment, appealing to a wide and varied scope of travellers. Whether it be yoga sessions and hot rocks, or turtle and whale encounters (in-season), perhaps fishing for the predatory silver streak known as Barra or just cocktail hour by the infinity pool there’s something for everybody -every time. All the while knowing the pleasures and creature comforts of the resort’s bar and restaurant area are but a boardwalk stroll away. 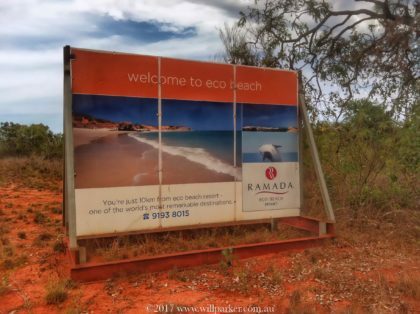 There is nothing hard about Eco Beach http://ecobeach.com.au/ in – fact the hardest decision you will make is what to do next, even if the outcome happens to be nothing. The beating heart of the resort is the reception area. 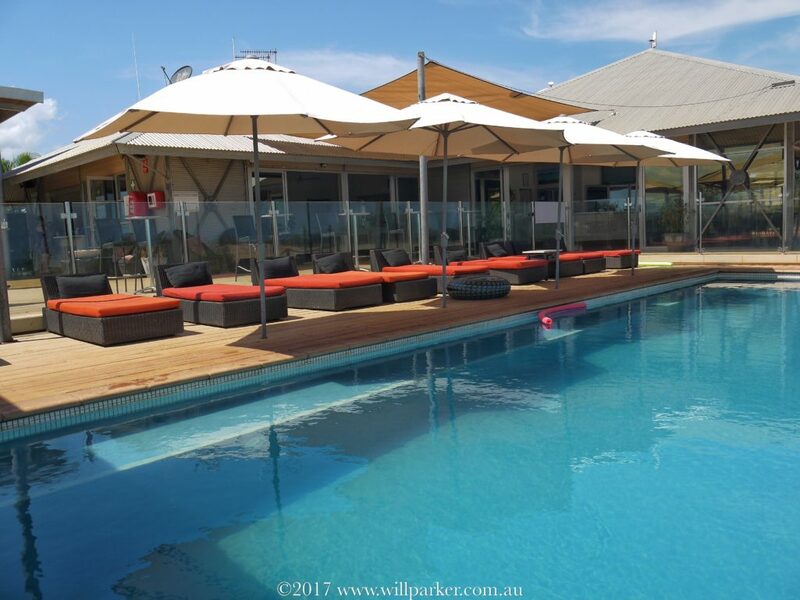 Jack’s bar and restaurant and the infinity pool are located here and are framed beautifully by a view of Roebuck Bay – all boardwalks lead to this area. View back towards “Jack’s Bar” over the infinity pool. 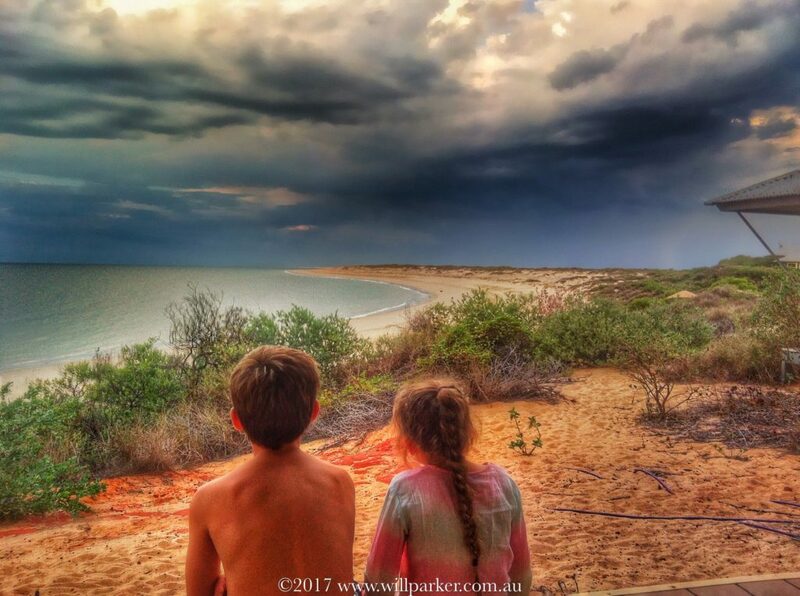 Roebuck Bay is the view and the playground of Eco Beach. To play in it, on it, walk along – marvel at her stunning colour or find yourself drifting away into the seemingly endless horizon you can’t avoid of dismiss her. 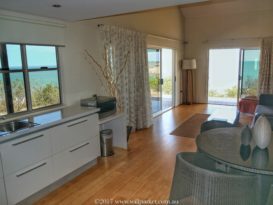 The view of “Roebuck Bay” is hypnotic. Eco by name and nature. 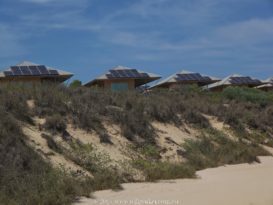 Many initiatives have been implemented at Eco Beach, solar panels which generate 2kw of electricity. All water is sourced on site from a bore and three large water tanks capture water. Waste water is recycled through a micro-organic waste water system and used for irrigation. 1.5km of boardwalks linking all points of the resort ensures a minimal footprint. Boardwalks linking some of the Eco-Tents. Soloar panels powering ocean-view villas. Boardwalks, left takes you straight to Jack’s bar & the pool. 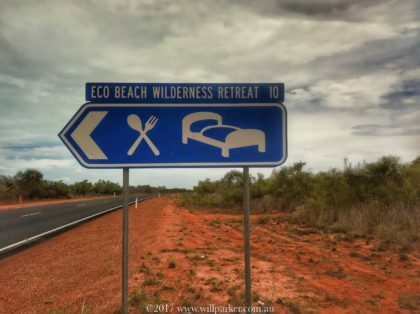 At the very least Eco Beach is glamping at the highest level, at best you’ll never be more treated in a remote wilderness location. The 4.5 star villas leave you wanting for nothing, while the Eco Tents get you sleeping as close to nature as one can be – in a proper bed. 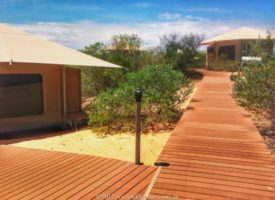 All who stay must be mindful to venture out of their 4.5 star comfort especially at night and wonder at the million star Kimberley sky that overlooks above – it puts everything into perspective when it comes to star ratings. Perfectly suited for couples but with a maximum of four guests wanting to enjoy a getaway. The eco villas offer you your own luxurious space to enjoy. Included inside of these guys is a king bed, kitchenette complete with microwave, toaster, kettle, free tea & coffee and bar fridge . 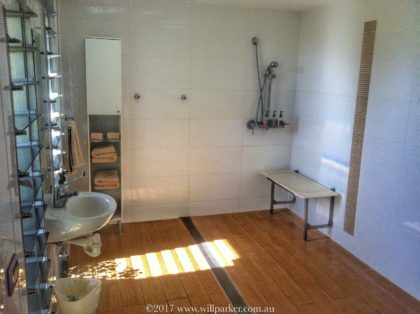 The ensuites are fabulous, there are fans throughout and all villas are air-conditioned. Ocean-front villa kitchen & living area. Living area of villa out to deck & view. Looking through the ocean-front villa, bedroom at rear of pic. 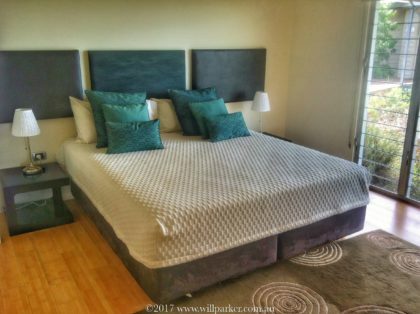 Are perfect for those who want to be close to nature whilst still enjoying comfort and convenience. This option will suit both couples and families wanting a casual family holiday. These tents are 12v only, they consist of a king size bed, ensuite & fan. Well ventilated, nice bed & bit space-Eco Tents. Each villa has a microwave and a small bar fridge. There are no hot plates or ovens, there is a communal BBQ which has a wok burner near by – remember to bring a bag or basket to carry your gear. Consider bringing your Engel to supplement the bar fridge and perhaps a small butane gas stove with frying pan to use out on the deck. There is no power for anything other than a mobile phone in these tents. An Engel hooked up to a portable solar panel would give you a fridge. Couple that with the communal BBQ, you could achieve/manage a couple of days. 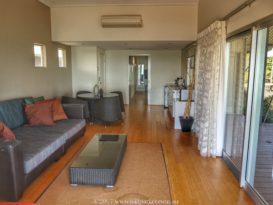 If you were a family of four planning to stay for two or three nights and eat all your meals at the restaurant, added to the cost of the accommodation, it would be a pretty expensive get away. However if you can eat out once as a treat and self cater the remaining, it can be viable. 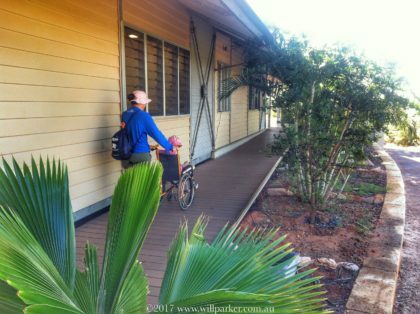 The disabled will cope well at Eco Beach Resort, especially people in wheelchairs. Selected villas have specially designed bathrooms with fully wheelchair access with all necessary seating and hand-railing. The resorts boardwalks make it possible to get around and most staired areas have accompanied ramps. Getting my Daughter around with broken leg. 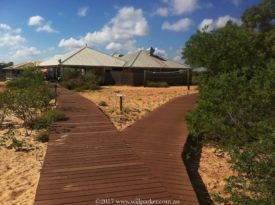 A 12km 4wd east along the beach from the resort will land you at Jacks Creek. Thread fin salmon, Mangrove jack and Travelly are generally about. In the warmer months when the water is warmer the predatory Barramundi or Barra as they’re more affectionately known, become prevalent. One hooked will be a highlight. If you have young kids, say 5-8 year’s old, who are interested in fishing but concentration is an issue for long periods, and you’re reluctant to pay the expense to get to Jacks Creek, a short walk either way along the beach will find you some water away from any crowds and give your young one an opportunity. Should it only last 10-15 minutes before sand-castles and swimming are more attractive, all’s good. 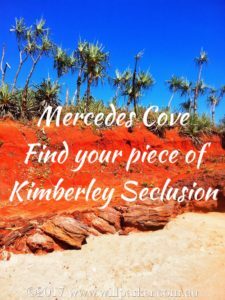 There are some really interesting beach and bush walks to be enjoyed of various distances. For us, the pick was the caves walk. Heading onto the beach from the resort wander left or west. Walking along this stretch of beach has to be completed on a low tide of less than 4m, on account of several headlands which have to be rounded. 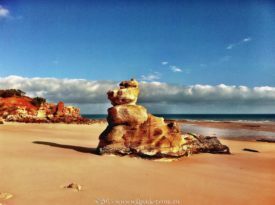 You will pass many varied and wonderful rock formations including the Mini Bungles, Lion Rock, Salty Cliffs, Osprey Rock, Cape Villaret and finally the caves. The attractions are evenly spaced – total distance is approximately 3.5km one-way. Mini Bungles reflecting in the low tide. 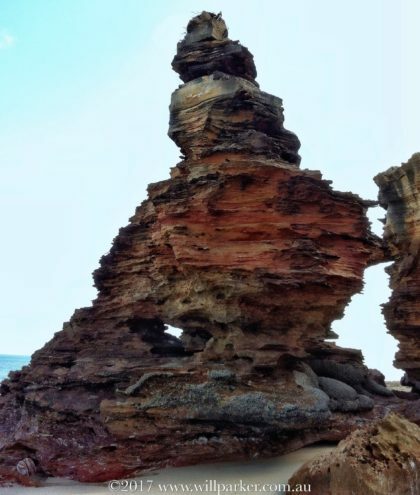 The ‘Old Boot’ rock formation. First footprints in the cave after high tide. 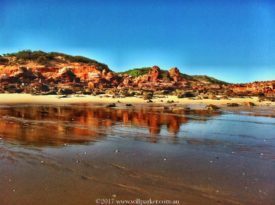 Cape Villaret-marks the southern entrance to Roebuck Bay. Engage the kids in what they are seeing, explore – not just look at rock formations and rock-pools, take lots of pictures. Nature and the natural world can become your best baby sitter. Osprey Rock-tiny osprey at top. 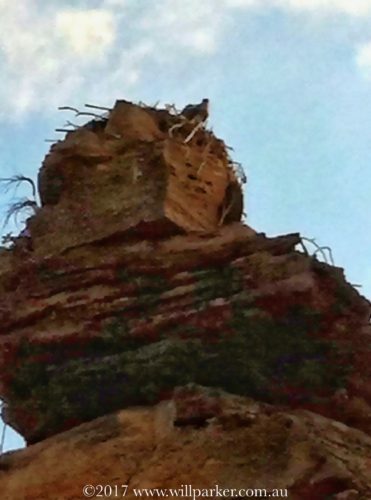 Osprey enjoying the view from her prime real estate. Always allow time to get home don’t get stuck on an incoming tide, Kimberley tides race and are incredibly quick. 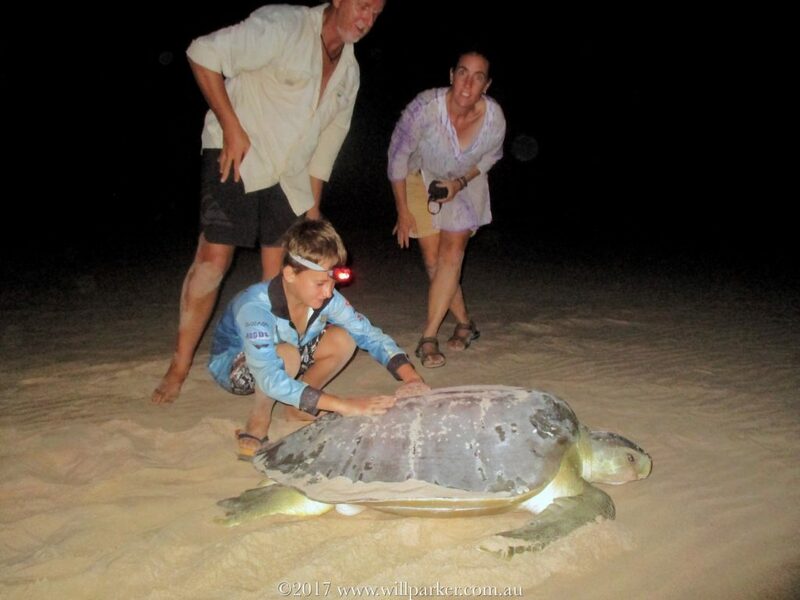 In season (Nov-Dec) the Kimberley’s Flat Back Turtles return to the beaches around Eco Beach. 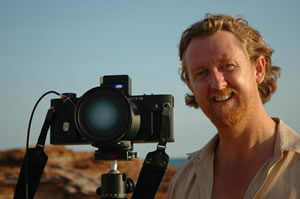 We joined Conservation Volunteers Australia on a Turtle monitoring survey and had a ball. Being able to watch turtles dig their chamber then clutch (lay their eggs), then do the scientific stuff like DNA samples, reading of bar codes off tracking devices, measuring/touching while learning was an invaluable insight and experience for the kids. In season (July-Sept) each year humpback whales wander up the Western Australian coast to the warm Kimberley waters to give birth and raise their young. 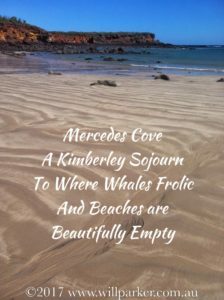 Eco Beach is a wonderful location to see these leviathans of the Kimberley ocean with many breaching & frolicking in the waters of Roebuck Bay directly out from the resort. 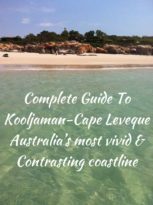 During the months of April – October the waters of Roebuck Bay are great for all manner of water activity, getting on a board or kayak is a great way to enjoy the beach. This is the place to go when you want to say you’re doing something but what you’re actually doing is relaxing and not much at all. Massage, hot rocks and yoga – treat yourself. Outside of peak time, April-Sept, check for availability. Cool pool with a hot view! For some, the holiday starts and ends here. The pool is wonderful and a great place to hang out but it’s not a public baths. There are lots of couples, honeymooners and parents enjoying special occasions without their kids. Kids are welcome but have to be well behaved to be here – rowdy, bad behaved kids get removed. 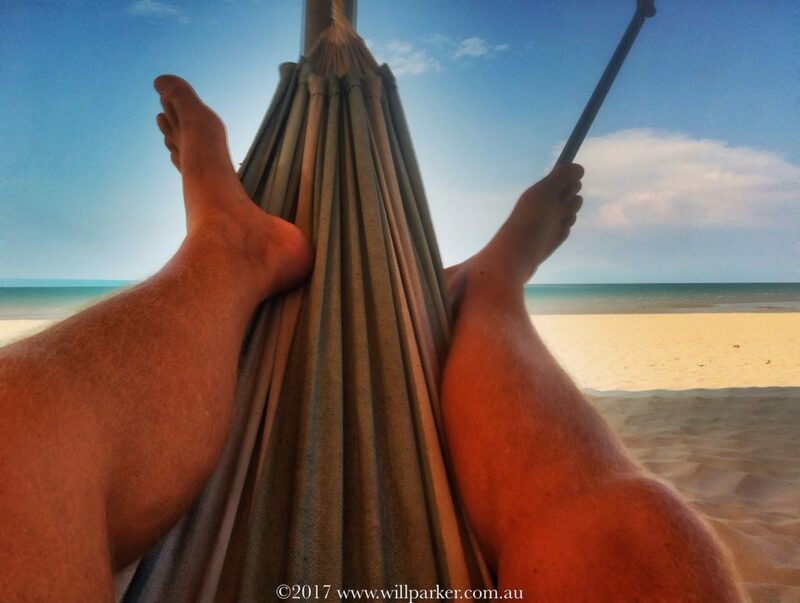 Strung up under a series of beach shelters, these hammocks are like instant tranquillisers – sleep time as you shoot the breeze. And the kids play. Shooting the breeze! Talking about adventures had & adventures planned. Open all day – everyday! Three square meals, drinks and ice-cream. Occupying arguably the finest position of any restaurant in the North West perhaps even Western Australia, Jack’s restaurant will enchant you before you even order. Imagine yourself enjoying a moment. In addition to its standard menu, a range of special dining experiences are available upon request. Including beach dinners, picnic hampers and private dining. This is a restaurant as good as you’ll find anywhere, they have high chairs and a good kids menu. Plan a meal out – kids on best behaviour though, it’s no café. With a host of ceremony and reception locations. Excellent facilities including business-conference centre and meeting room, accommodation and a world class chef. Your special day, corporate event or workshop will be a breathtakingly stress free experience, for you and your guests. Groups of 2-120 can be comfortably accommodated. The weather in the dry season (winter) April-Aug is most temperate for southern visitors – it’s also the busiest period. All villas are well positioned to catch breezes and are air conditioned. Eco Tents too are excellently ventilated and positioned to catch breezes with no air conditioning. 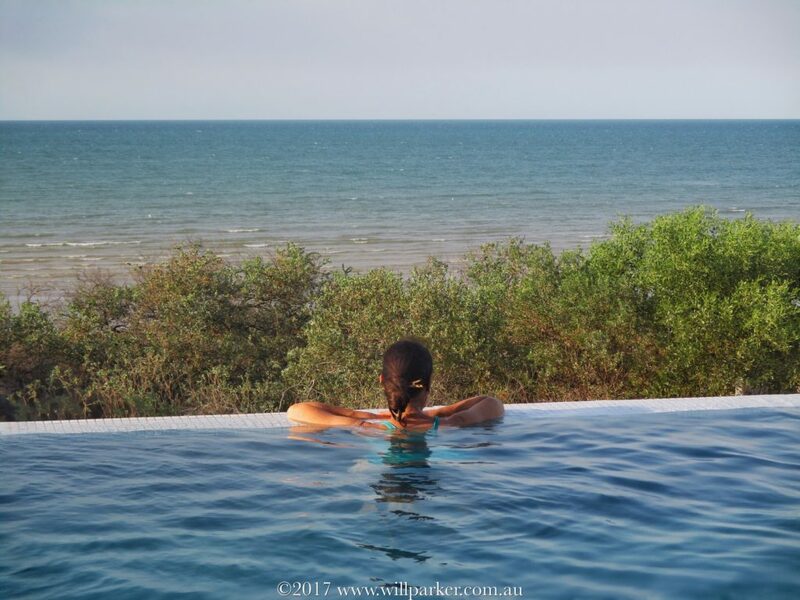 The infinity pool is a wonderful asset. With Whales in August-September and Turtles in November-December, reasons enough to come out of peak time. Some great deals are also offered late in the year. Dry season-winter is nice. However you won’t be captivated with views like this from your ocean front villa unless you give the ‘Wet’ a go. The whole vibe of Eco Beach is to unwind. However all the creature comforts and eye catching natural beauty doesn’t come cheap – as nice as it is. Allow yourself two nights (during season) and come mid week out of season and stay four nights. 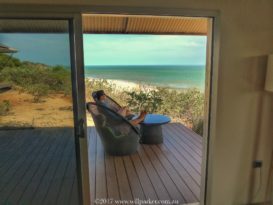 Eco Beach Resort is a 1.5 hour drive south of Broome – 120km along the Great Northern Highway and then 10km along a well maintained pindan-red dirt track. 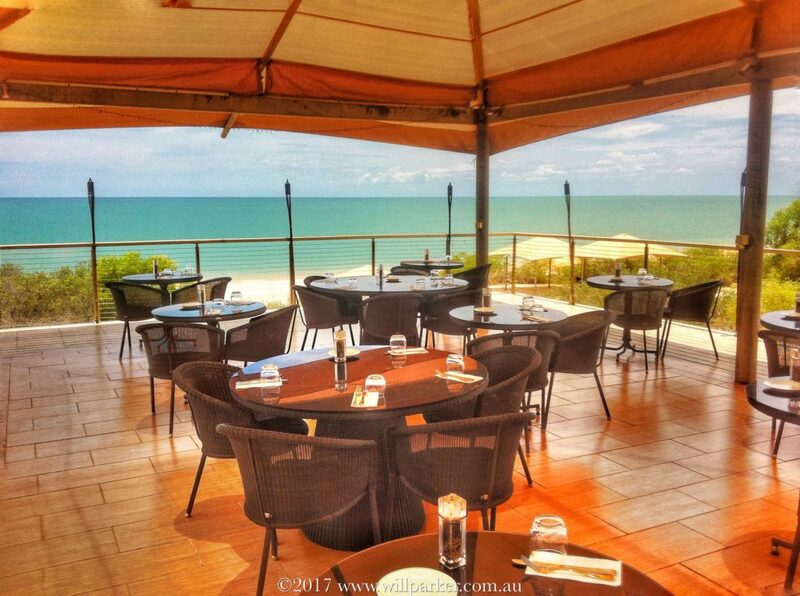 Alternatively a 25 minute scenic helicopter ride from Broome across Roebuck Bay. Eco Beach is very much designed for couples of any age who want fantastic accommodation, who don’t want to cook, enjoying all meals in the restaurant and all drinks by the pool, surrounded by eye-popping wilderness. And if possible arriving by plane or helicopter. 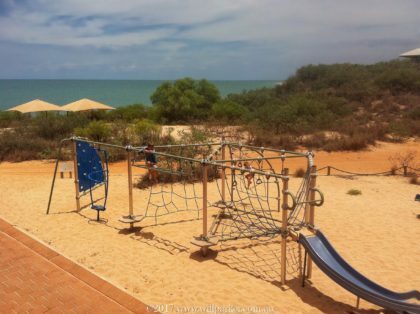 Having said that, they are trying very hard to cater for families, the playground is a great addition, there are complimentary beach toys & heaps of board games for loan. Kids playground-heaps of climbing fun. 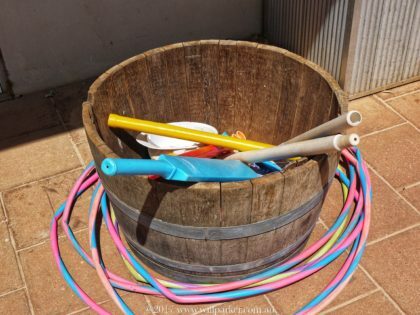 Complimentary beach toys for kids. The restaurant has a good kids menu and there’s more than one high chair. Kids are welcome in the pool buts it’s a grown-up’s environment. The tours are kid friendly, especially the turtle tour for kids between 6 year’s old & up. 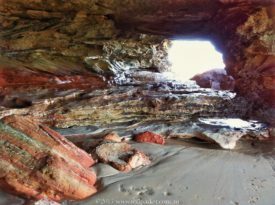 The natural environment is a great playground at Eco Beach, get your kids out on the beach and exploring the caves walk. 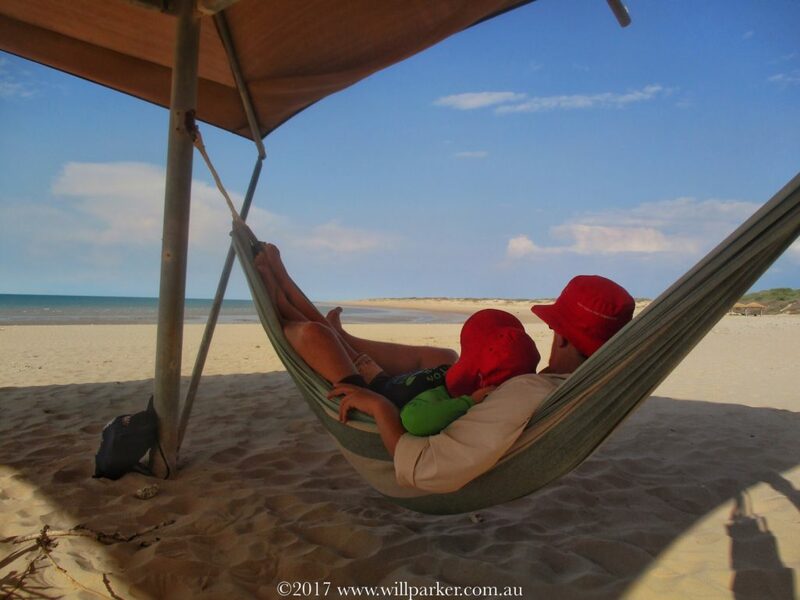 A trip to Eco Beach is very achievable with kids, however at times they will be required to be part of a grown up world. About all that’s left to do is this. “As you move through this land, allow your body to relax, and tune into nature. Stop often! 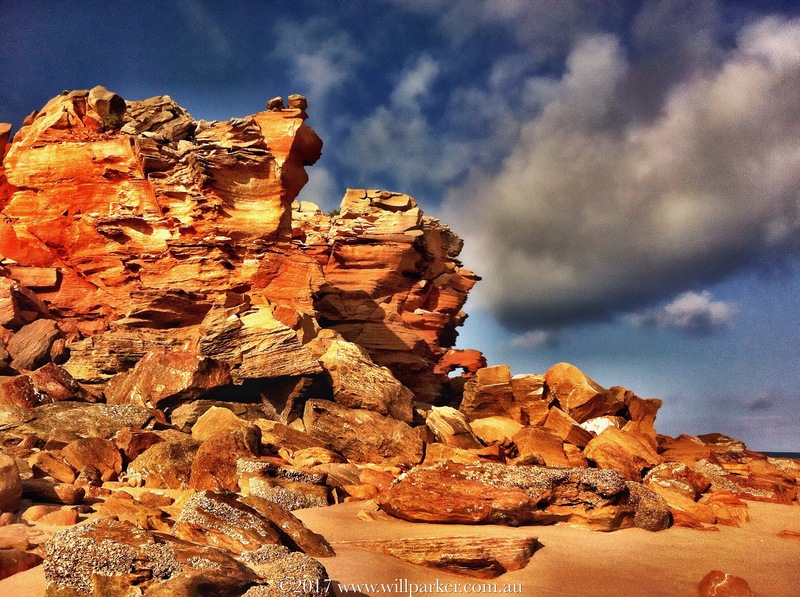 Look wide – listen, smell, have a feel of the rocks and shells. Let your senses come to life and appreciate the environment”. Have you been to Eco Beach recently? Would love to hear your thoughts. 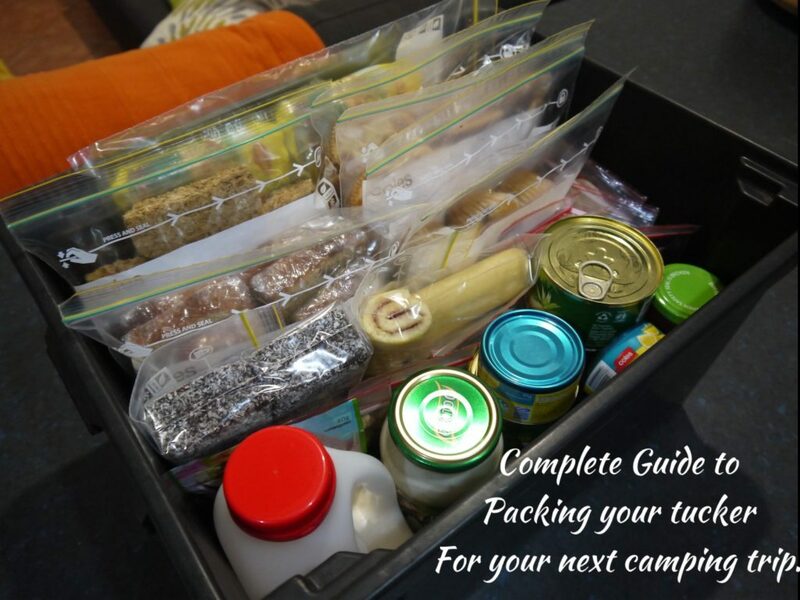 Tucker packing Guide – For your next camping trip.